Are you ready for some football? 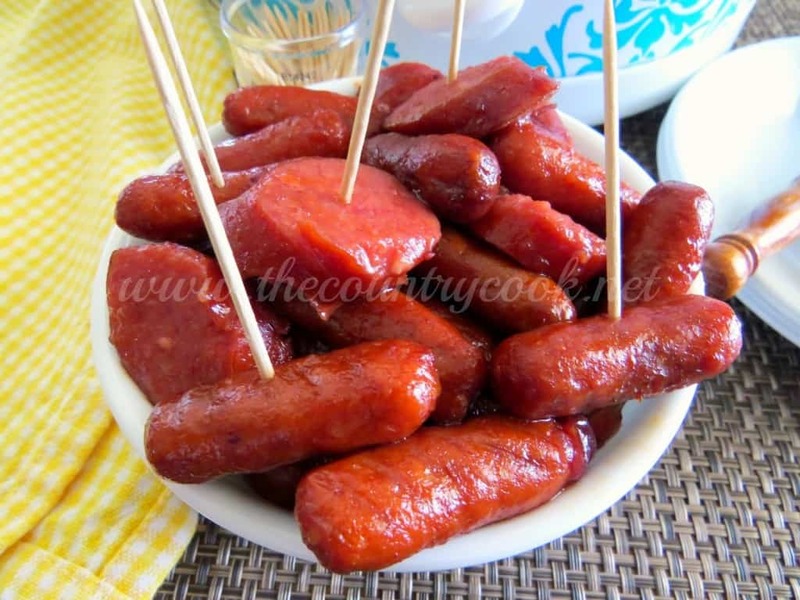 If not, are you ready for some Super Bowl party food? I’m in that second category there. Oh, and those commercials. It’s the one time of year that I don’t get frustrated with having to sit through a ton of commercials! And this year we have all the “Deflate-Gate” controversy so even I have to admit that I’ve probably paid a little more attention than I should. So, who are you routing for? 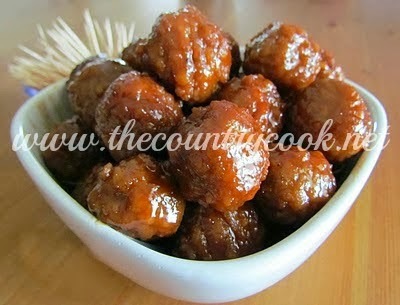 And better yet, what are ya making to eat for your Super Bowl parties? Speaking of “The Big Game”, did you know that technically you aren’t supposed to use the words “Super Bowl” on anything because it’s trademarked? You can call it “The Big Game” but you can’t use the words “Super Bowl” on any advertising or products or anywhere for that matter without specific permission from the NFL. So technically, I shouldn’t call it a Super Bowl party, but rather, The Big Game party. But y’all know what I mean and I know what I mean and I’m pretty sure the NFL would be happy that I’m encouraging folks to watch The Big Game and eat. Oh, and watch those commercials. Have you seen any of the leaked ones yet? The Budweiser ones are tearjerkers every time. Wait, am I allowed to use the word “Budweiser” or do I have to call it the “The Big Name Beer”? 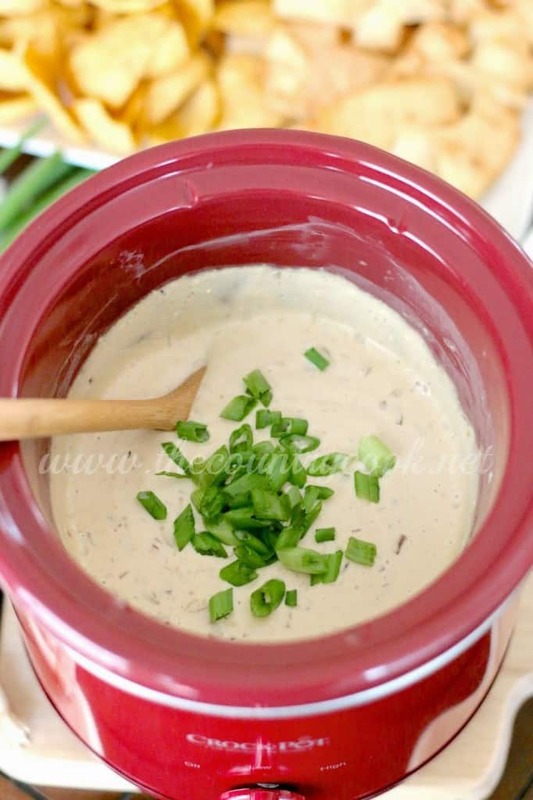 Anyhoo, this dip. THIS. DIP. Only 3 ingredients!!! And it is crazy good! Plus, you just whip it up in your crock pot and boom – you’re done. It’s warm and creamy and packs a whole lotta flavor. 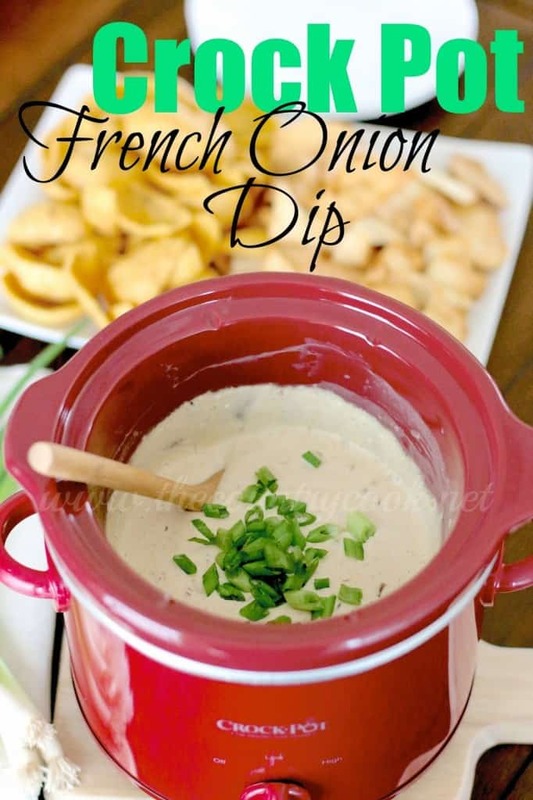 I love French Onion Dip but serving it warm like this was really, really good. Try it, I know you’ll love it! 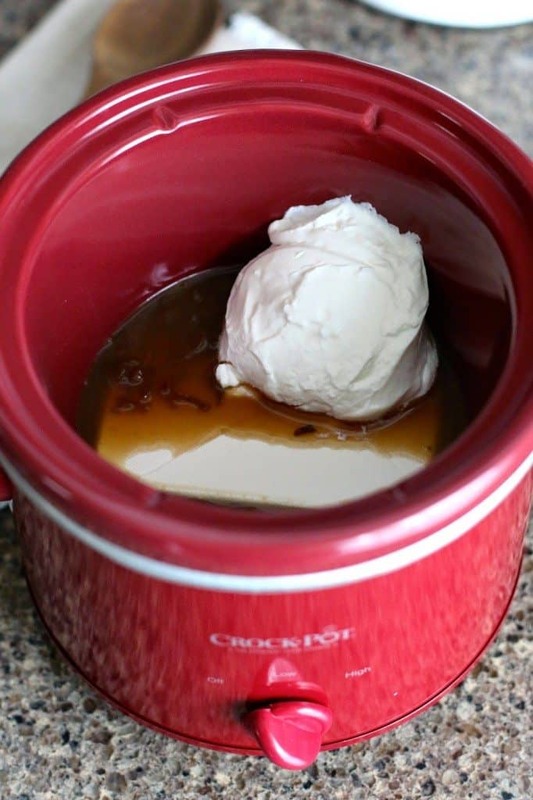 Pour can of French Onion soup into the bottom of your mini crock pot. Note: The pot I am using here is a 2-quart pot. 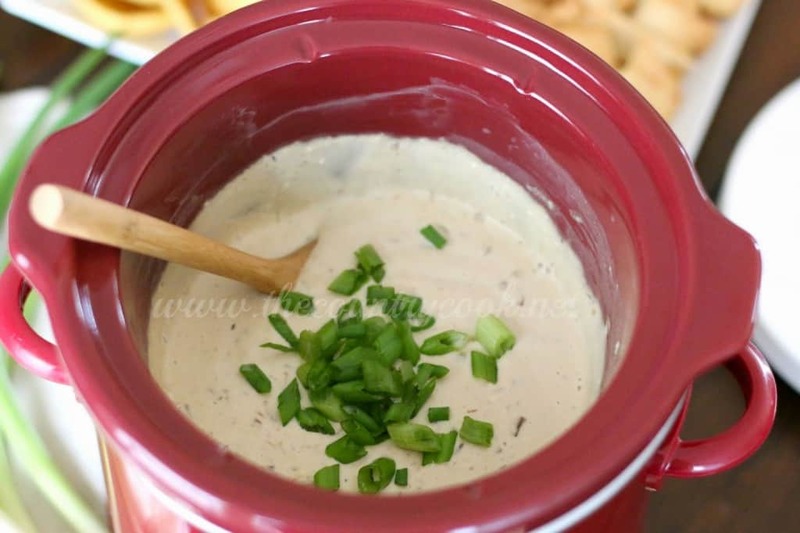 Perfect for dips like this! If you try to use a bigger slow cooker, it will burn. So if you don’t have a mini crock pot, just heat this all up on your stove and stir until combined. Next, place the block of cream cheese on top of the soup. Note: This cream cheese was not softened beforehand. I just took it straight out of the fridge and added it in, Next, top all of this with sour cream. No need to stir. Place the lid on and set the crock pot on low for about 2 hours. When done, remove lid and stir well using a whisk. You need to whisk it real good for a few minutes to get it nice and smooth and remove any bigger lumps. Then top with chopped green onions and serve. You can keep it warm in the crock pot (just keep the lid on) and have guests help themselves. Or you can place it in a dish and serve that way! 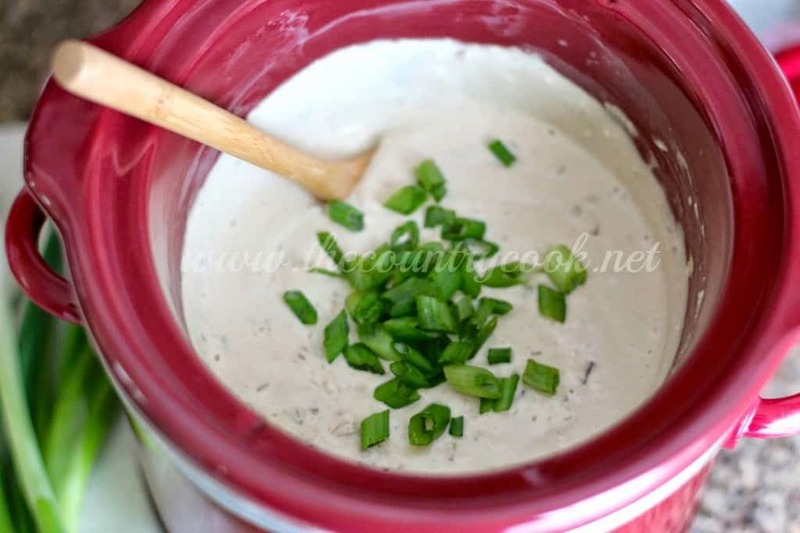 Serve with Fritos or Pita Chips or whatever chip you love! 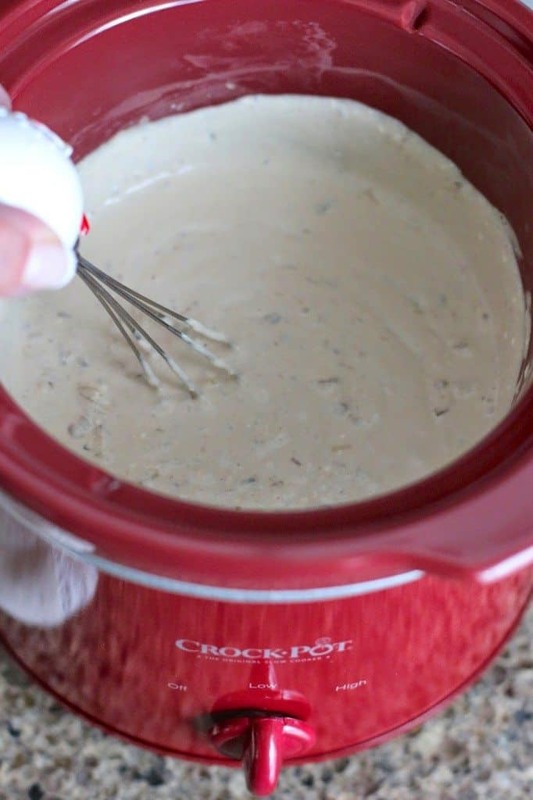 Pour can of French Onion soup into the bottom of your mini (2-quart) crock pot. When done, remove lid and stir well using a whisk. You need to whisk it real good for a few minutes to get it nice and smooth and remove any bigger lumps. You can keep it warm in the crock pot (just keep the lid on) and have guests help themselves. Or you can place it in a dish and serve that way! 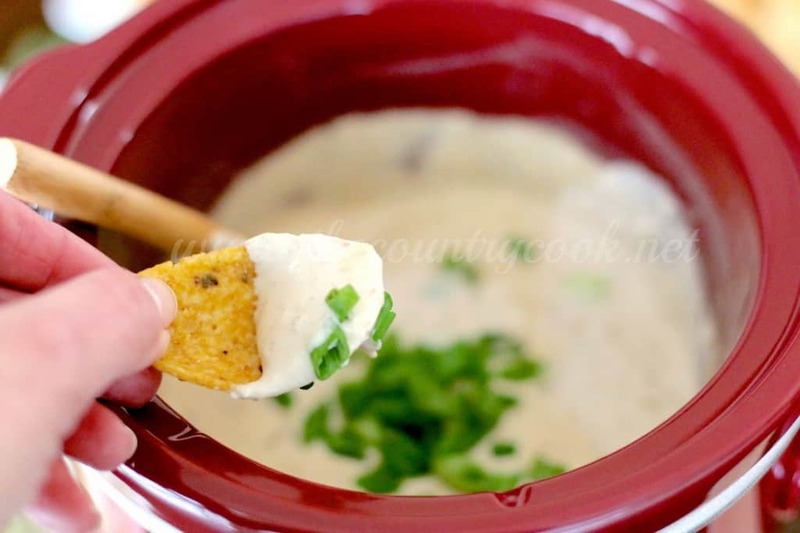 Serve with Fritos or Pita Chips or whatever chip you love! 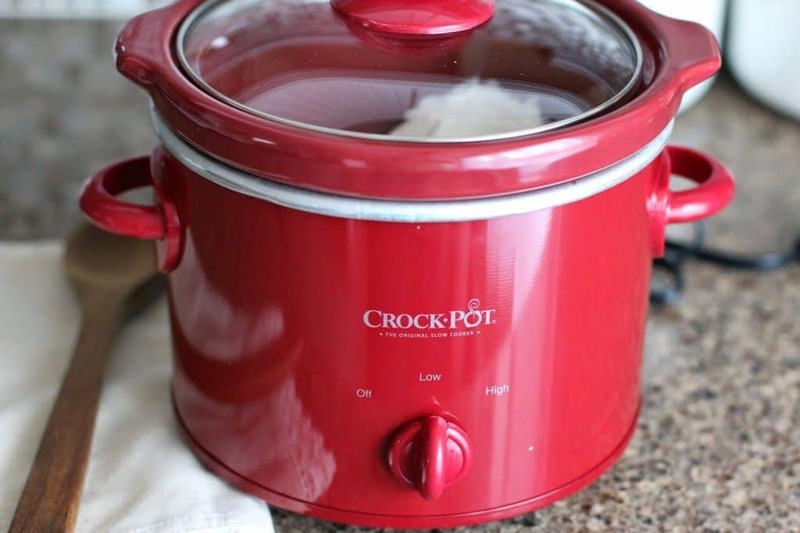 If you don't have a mini crock pot, just heat it all up on your stove and stir until combined and warmed through. Whisk well to remove lumps. 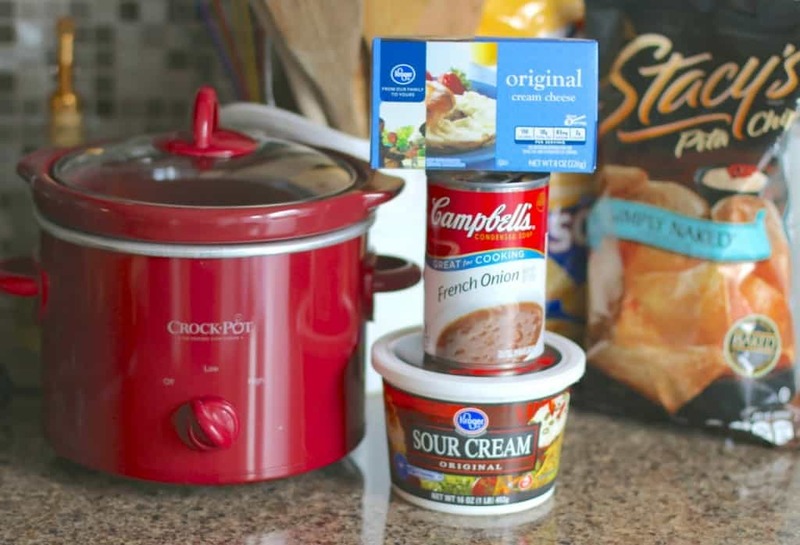 Check out these other Crock Pot Party Foods! 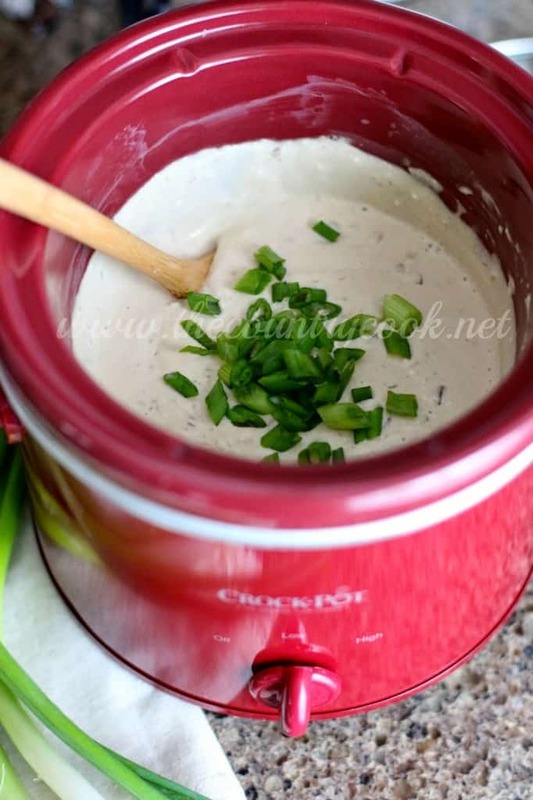 Would a 1.5 Quart slow cooker be big enough to hold the dip? Hi Kim! – yep, it's good cold. Just stir well before serving. 🙂 And also, this would fit just fine in a 1.5 quart slow cooker. Hope that helps! This sounds real good Brandie. 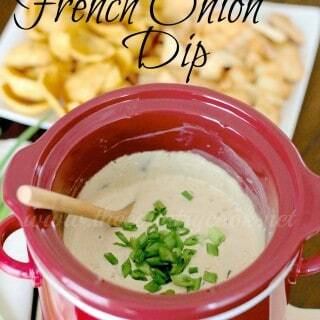 I had a favorite store bought French Onion Dip years ago but that brand went away when that store closed. Fritos are my favorite with it!! Pinning it!! Do you think it would burn in a 2.5 crock? Thinking of using my triple server for some yummy snacks….thanks! Robin- I think it will be ok in the 2.5 crock. love this and only 3 ingredients right up my ally. I just made this and it was amazing and easy. Definitely keeping this recipe! Is it supposed to only be 1oz cream cheese? Sounds so yummy!